The thermometer is supplied with one lithium cell (CR2032). Operating Instructions 1. Gently squeeze the opposite ends of the thermometer to pull off the probe cap. Do not use force in removing the cap. 2. Press the “ON/MEM” button (located below the LCD display). 3. The thermometer is ready for use after the ear icon stops flashing and two beeps are sounded. 4. Gently pull the ear back to straighten the ear canal and snugly position the probe into the ear canal, aiming towards the membrane of the eardrum to obtain an accurate reading 5. Measuring the ear temperature: Use the index finger to hold the “Scan” button (located other side of LCD display at the top) down until you hear a beep. 6. 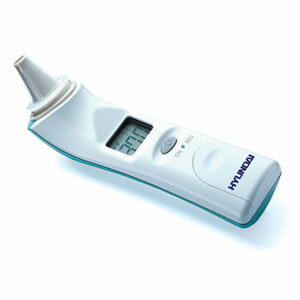 Remove the thermometer from ear, the temperature reading will display on LCD screen. 7. To turn off thermometer, hold down “ON/MEM button until you see “OFF” on LCD display or device will automatically shut off after 1 minute to extend battery life. 8. Replace probe cap after use.